When storms occur in the early part of the tornado season through the Southern Plains they will be faster moving storms than the storms that occur in the Northern Plains in the latter part of year. This is associated with that large “dip” in the Jet Stream that we mentioned earlier, called a “trough”. 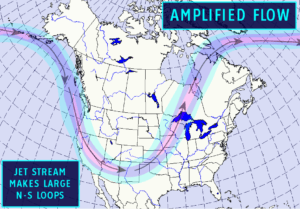 As the Jet Stream makes larges dips from the north to the south or “troughs”, this amplifies the flow, or rate of speed, of the air moving back to the north-northeast. Storms will generally form under the southeast to northeast side of the trough, under the amplified flow. These fast moving winds are the steering mechanism for thunderstorms. Therefore, if the Jet Stream is moving at 75 mph, and the surface flow is 20 mph, we can generally assume that storms will be moving at a rate of speed of about 55 mph. If this is the case, then it makes storms extremely difficult to chase. The basic method here would be to try to get in front of the storms and place yourself in as safe position as possible and hope to see something as it goes flying by your location. Again, this is more of a rule than a law. Not every storm in the early spring is going to go flying by at great speeds, but faster moving storms are more apt to happen in the early part of the season in the Southern Plains than in the later part of the season in the Northern Plains. The reason for storms being generally slower in the Northern Plains is, yes, the Jet Stream. As it retreats further north it becomes more linear in nature during the latter months of the peak tornado season. This means that it doesn’t have such a deep trough. Therefore, the upper-level winds are generally slower due to a less amplified feature in the jet stream. There are pros and cons to both.